Thaddeus, Was he for real? Bible References: Matthew 10:3; Mark 3:18; Acts 1:13; 6:16; John 14:22. Back Story: Most likely Thaddeus (Thaddaeus) and Judas, Son of James, are the same person. 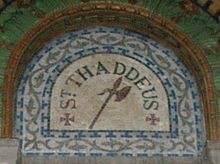 Thaddeus is the surname for Lebbaeus (Matthew 10:3, KJV), which means “heart” or “courageous.” Likely was born (possibly in the town of Paneas) and reared in Galilee, the same as Jesus. A tradition is that his mother was a cousin of Mary, mother of Jesus, which would make him a second cousin. His father was Alphaeus. James the Less, was his brother and a disciple of Jesus. The Bible provides no information on Thaddeus occupation before he followed Jesus; some scholars suggested he was a farmer. From time to time Thaddeus was identified as the Jude who wrote the Epistle of Jude; but, there is little if any sure knowledge to reach this conclusion. Story Line: Thaddeus asked the question that many Christians want to ask Jesus: “But, Lord, why do you intend to show (manifest) yourself to us and not to the world?” (John 14:22, NIV). Jesus didn’t answer Thaddeus questions directly, but instead used the question as a teaching opportunity. Jesus answered him, “If anyone loves me, he will keep my word, and my Father will love him, and we will come to him and make our home with him. Whoever does not love me does not keep my words. And the word that you hear is not mine but the Father’s who sent me (John 14:23-24). Like most of the other disciples, Thaddeus abandoned Jesus when Jesus was arrested; however, with Jesus’ resurrection he came to believe that Jesus was the Son of God. Tradition holds that he preached in Judea, Samaria, Idumaea, Syria, Mesopotamia, and Libya. Tradition, again, holds that Thaddeus founded a church at Edessa, Syria. There he was crucified as a martyr in about 65 AD. In contrast to the Edessan tradition, another is that he was executed in Persia by an ax. An ax is often shown in artworks depicting Thaddeus. Thaddeus dead body is thought to be interned at St. Peter’s Basilica in Rome, where his bones remain to this day. Alternatively, Armenians believe that Thaddeus’ remains are interred in an Armenian monastery. Thaddeus (St. Jude) is the patron saint of Armenia. His feast day on the Western calendar is October 28. Reflection: One of my challenges is that I want everything in the Bible laid out concretely. In particular, I want to know the names and significance of all the Apostles. My husband is so good he keeps reminding me that I have to take Christianity on faith. This entry was posted in Apostle and tagged Apostle, Carolyn Roth Ministry, Christianity, Judas, Jude, Obscure Bible Characters, Thaddaeus, Thaddeus. Bookmark the permalink.